Yingluck does it better with more style. You have a point, not sure if Kobkarn is smirking at the injustice. While i understand the criticism, i hope no one is expecting anything better from her repacement. If she was doing such a wonderful job, perhaps she can explain why she got sacked? That normally happens when you are failing badly. Apparently she kept insisting that there should be elections immediately. Can anyone say how she actually got the job in the first place ? Her husband is Police Major General Chonassit (? ):)))...Nuff said. Hardly enough. 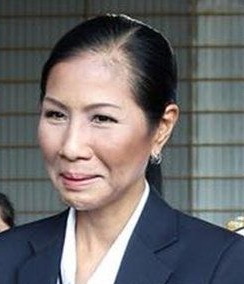 She was educated in the USA and Chairman of Toshiba Thailand which her parents own. Major Gen is small potatoes. ...at least she will not be accountable when tourism numbers dwindle with the smoke-free and potential beach racket fines that are to be feared ? .....not to mention tourists who may not continue to patron filthy beaches with sewage water pumped into the sea nearby ? .......not to mention the visa hassles that many quality tourists, retirees have to go through on entrance or on their extensions...all things are connected !...Perhaps the new Harvard educated minister will clean up the mess ? ... or make things worse ?!! To quote Bugs Bunny, "What a maroon!" When people ride high on the wave they forget things such as humility. Good riddance of a self-righteous pompous mp. Excuse me paleease, if you are going to quote a god, do it correctly....its "ultra maroon" tho my all time fav is "sharp as a sack of wet mice"... (also used by FHLH).......... yours sincerly a self righteous pompous BB fan..??? Never in the field of tourism have so many turned out to be so few! And for that you get the boot! 21% increase in tourists in October, was that her figures or the new one's I wonder. But glad she has gone as cannot stand that smirk on her ugly face any more, but will the lies also go with here, I don't think so. I think that wonderful 10 years medical hub retirement visa was her brainchild. We'll see her selling health insurances soon. Will we get some honest arrival figures now I wonder ? Why would you think that the figures were not correct? Its amazing how many Thais have to go outside of Thailand to be educated by Farangs. Yet their learning of values, such as freedom of speech and equal respect for others, seems to dissipate as soon as they land in LOS. Have they learned nothing ? 1. Because the numbers claimed did not gel at all with what was seen on the ground. 2. Because the numbers claimed would require motre flights than could be accommodated at all the international airports of Thailand. 3. Because all passengers landing in transit to other places (usually other countries) were counted as Thailand tourists. 4. Because people leaving and then returning (eg foreigners travelling home then back) were counted as tourists. Probably lots more rorts as well, but chiefly, the tourists and revenues claimed were not reflected in actual revenue terms and the continual contradictory reports of tourist-based business in the major resort towns were not explained.